Bone conduction transmits sounds to the brain through vibrations on the bones of the skull, instead of using the eardrum. Technology that applies bone conduction may very well be the savior that will dramatically improve workplace environments of the future. In particularly loud workplaces, a bone conduction microphone blocks out background noise to enable clear and safe conversations. It also helps to pass down technical know-how and revolutionize the way office work is done. We followed the future shaped by the bone conduction technology. - Lots of people work in extremely loud places like factories and construction sites. - Communicating with walkie-talkies, PHSs and similar devices is difficult in loud job sites like these. For safety reasons, workers need to stay attuned to surrounding sounds and cannot afford to cover their ears to talk on their devices. 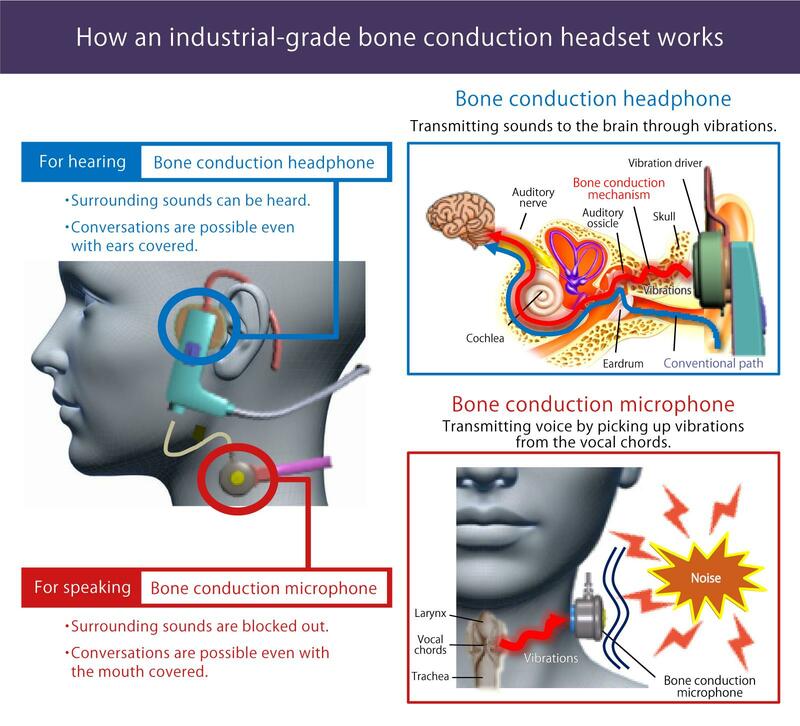 - Panasonic developed an industrial-grade bone conduction headset that enables clear communications in noisy environments, by applying know-how fostered in the consumer audio products field. The headset has been adopted by Toyota Motor, Tokyo Metro and others. - Other ways of using the headset are expected in the future, e.g., telecommuting and passing down know-how via dictation. Sound intensity is expressed in decibels, dB. 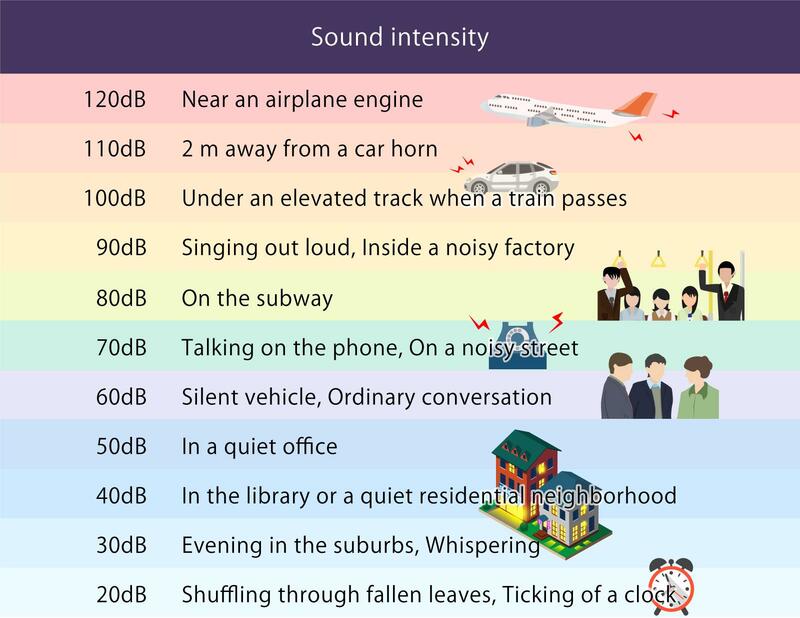 Normal conversations are said to be 60 dB and the environments inside of subways and trains 80 dB, but what would 90 dB be like? The answer to that is inside a noisy factor, the middle seat in a karaoke booth or 5 m away from a barking dog. In other words, 90 dB is a very loud environment. Intensities of common sounds. Sounds of 90 dB are very loud in any environment. A lot of people work in environments where the noise is near or over 90 dB, for example, in automotive plants where forging and pressing are performed, construction sites with heavy machinery and job sites for civil engineering projects. Day after day, they are exposed to loud noise. Verbal communications in places like these are relayed with walkie-talkies, PHSs and cellphones. But since the noise; there is little chance of having a clear conversation. Yet, verbal communications are critical on the frontline of manufacturing and infrastructure projects. Misunderstood instructions can not only interrupt workflows but, in worst cases, also result in accidents. 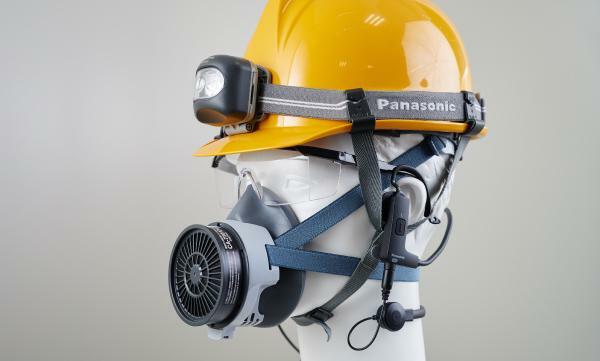 Having understood work sites like these as needing a safe and effective means for relaying verbal communications, the Innovation Center at Panasonic's Connected Solutions Company (hereinafter "Innovation Center") came up with a bone conduction headset for use in loud workplaces, which businesses now are making full use of. Bone conduction technology transmits sounds directly to the brain using vibrations, instead of channeling the sound through the eardrum. This industry-first bone conduction headset was developed from technology Panasonic nurtured in the consumer audio field, to enable "hearing and speaking" via the head and neck bones near the ears. It couples a headphone capable of transmitting vibrations of low to high frequency, with a combination directional microphone of high SN (signal to noise) ratio / bone conduction microphone to enable clear sound quality. The headset can be powered from a connected device such as a smartphone or tablet, over a USB amp cable with a built-in audio amplifier. This feature makes batteries, which were required for earlier bone conduction headphones, unnecessary. It was introduced because it would have defeated the purpose of enabling clear verbal communications if the headset could not be used and work had to be stopped because the batteries died. Because vibrations transmit sounds to the brain through the bones instead of the eardrum, this technology enables clear communications in loud workplaces without covering one's ears. The biggest feature is that a directional microphone and bone conduction microphone are combined into a single unit. This is the first time in the industry that such a mechanism has been used for an industrial-grade bone conduction headset (as of 09/2018, Panasonic research). The bone conduction microphone is worn around the neck. It picks up the vibrations of the vocal chords and blocks out any background noise to convey just the voice. It employs the same PTT (Push To Talk) system as a walkie-talkie, so the user simply presses a button to talk. And, because it is worn around the neck, it does not get in the way of work. The headset weighs just 53 g and is waterproof to IPX5, so it can be used outdoors in the rain. It is ergonomically designed as an L-shaped frame with an earhook that wraps below the ear toward the back of the head, to minimize stress. Those creative efforts were recognized with the Good Design Award in 2017. The directional microphone is used in environments up to about 90 dB and the bone conduction microphone when surrounding noise is over 90 dB, but there are other situations that call for a bone conduction microphone. 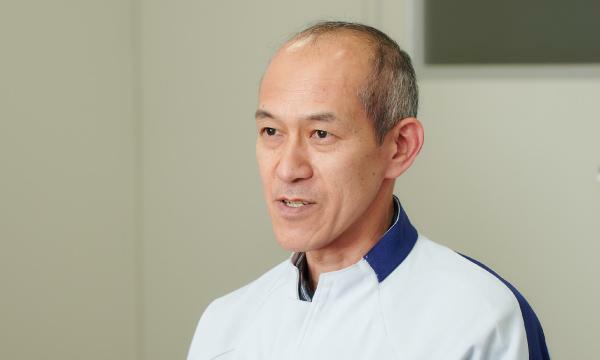 As Panasonic's Suguru Nakao explained, "Take tunneling work for example. You could be working in full gear - helmet, safety goggles and respirator. Your mouth is covered in that case, so a directional microphone wouldn't work. Therefore, a bone conduction microphone is suited for that kind of situation." The Innovation Center that developed the headset was spun off from Panasonic's business divisions in 2015 as an independent organization for developing visual, audio, wireless, device and other technologies. Their mission is to craft solutions that solve the customer's problem by putting engineers, who conventionally work behind the scenes, at the forefront of business to work directly with the customer. The bone conduction headset took this collaborative approach, as well. It all began when Toyota Motor was invited to a technical exchange at the Innovation Center and, while various technologies were being shared, the idea of "using the headset in noisy factories" was put forward. Looking back at those discussions, Mr. Nakao recounted, "If you've ever visited Toyota's factory, you know how loud it can be. Even group calls on walkie-talkies can be a drowned out by the noise. Communicating is critical to work, but then ear plugs must be worn in pressing and forging processes to protect against potential hearing disorders, so it is difficult to have a conversation. That led us to believe that bone conduction technology could work. The thought that our technology could revolutionize factory floors was a big motivation behind development." Connected Solutions Company, Panasonic Corp. The project was actually more difficult than imagined. Verification testing had to be done within personnel and budget constraints, and prototyping was full of all sorts of twists and turns. Testing began in 2015 in cohort with Toyota Motor and preparations for developing mass-production were launched the following year, but everything came to a halt because the key device was discontinued and plans had to be rethought. It took 9 months to develop a new key device and revise design specifications. Preparations for mass-production were resumed again in 2017, but the core members at the time lacked experience in mass-production. Therefore, the project was restructured to gain support from the various departments at the Innovation Center. The product was ready for sale in 2018. While the team sought help from others in the company to solve issues that popped up on the one hand, they operated like a venture business on the other by creating something from nothing on their own. Unlike most of the bigwigs in business, they "got their hands dirty" and came out with an industry-first product to show for it. "We brought over prototypes to Toyota Motor 5 or 6 times and kept tuning the specifications to what those who tried it had to say about it. Initially, we proposed a Bluetooth type headset, thinking that 'smart' was better, but Bluetooth eats up too much battery power, cutting out the signal. So, we settled on a wired type. There were lots of redoing needed, but after 2 long years of hard work, we finally achieved our goal," recounted Mr. Nakao. Parallel to this repeated prototyping, it was necessary to clear some 80 different regulations in order to convert the product from consumer-use to industrial-use. Within that work, a lot of attention was given to durability via countless drop tests and vibration tests. For the neckband, a shape memory alloy that, if bent backwards, returned to its original shape without breaking, was used. 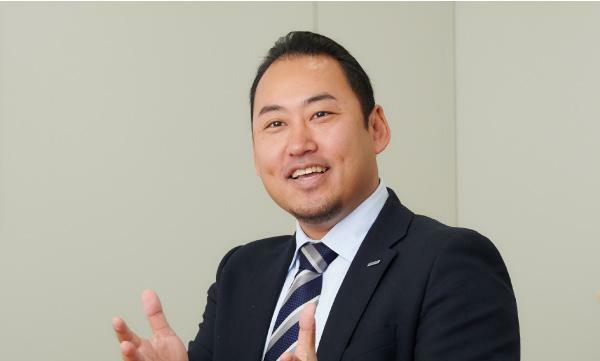 Talking about the project, Kazuhiro Kobayashi, also of Panasonic, noted, "The way we went about the project was a challenge to begin with, because it was like a start-up business. We worked with the customer to create a product rather than basing everything off of something already planned. Here, our engineers listen to the problem upfront and in person in order to seek answers, so we accurately zero in on solutions and shorten the time to do so, as well." Director, Planning & Development Section, Product Development Dept. 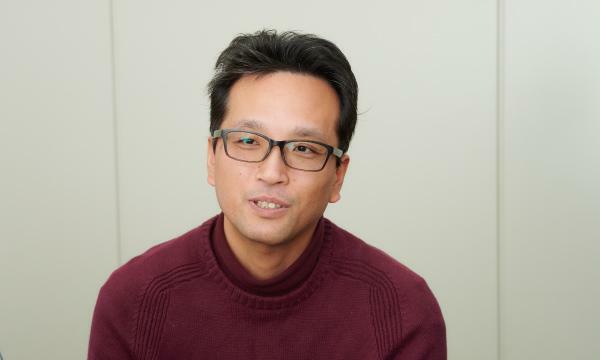 Production team member Kei Tasaka had been involved in see-through head-mounted displays (HMD) in the Innovation Center's visual technology research wing and joined the project halfway in. He said, "The very first time I heard sounds transmitted by bone conduction, I was amazed at how clear the audio was and how sharply defined the voices were." 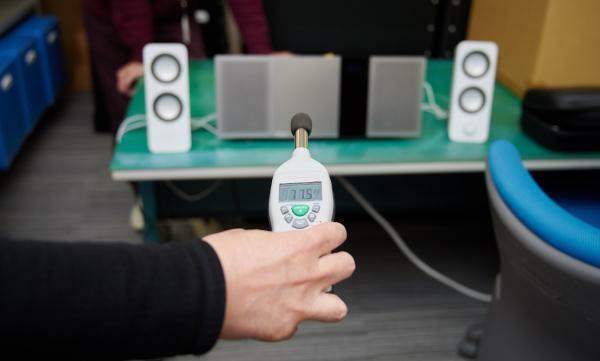 At Panasonic, there is a "recipe for sound" that has been passed down over the years like a tradition. As Mr. Tasaka explained, "That recipe for sound has been the basis for developing consumer products. Because someone who understood that recipe was involved with the project, clear voice communications became possible." The job of producing sound from that recipe rested with Hiroshi Kunimoto, a veteran who spent his entire career in this field. Modest in his choice of words, Mr. Kunimoto chalked things off to "repeated trial after trial: you listen, then make improvements." 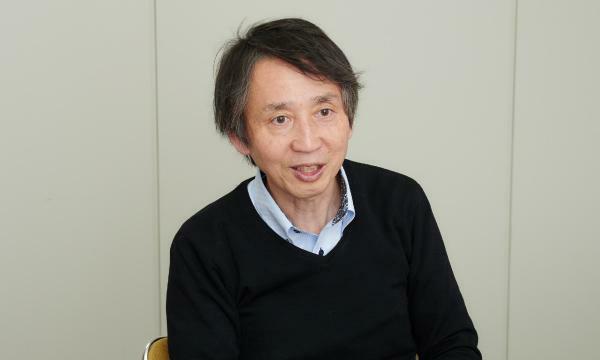 But, Mr. Nakao highly praised his work, "Seasoned experience went into sound production. This is where you can see Japanese manufacturing and the prowess and know-how of Panasonic at its best." 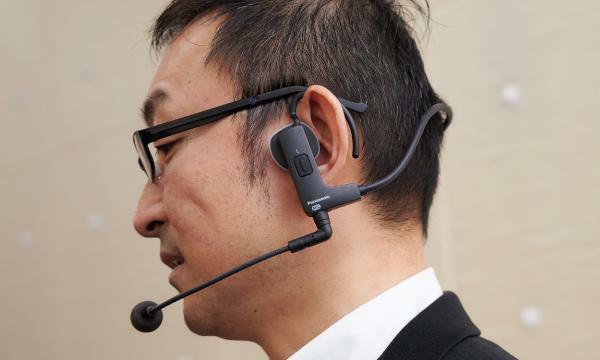 Following in the footsteps of Toyota Motor, the Tokyo Metro adopted the bone conduction headset for their operations. They have work teams use it when out inspecting and maintaining the lines. Because workers do not have to cover their ears to talk on a device, they can hear approaching trains and each other, so from a safety perspective, the headset has increased the sense of security. Moreover, the bone conduction headset is not limited to just field work. In today's world where telecommuting is becoming more and more widespread, it is being looked at as a useful tool for employees who work from home while on childcare leave. Reason being that a parent can communicate with his/her company while keeping an ear out for a small child. The headset was tested on a trial basis using business people on childcare leave as monitors, and a lot of positive feedback was received. The bone conduction headset worn for actual work. The earhook can be turned to adjust the fit to the size of the user's head. Other possible uses of the headset include voice entry. Having researched the needs of diverse industries, Mr. Kobayashi noticed the following trend. "There is a growing need in the workplace for audio evidence. It is needed to pass down the skills of veterans to new recruits. Behind this trend is a severe shortage of manpower in the field. Dictated audio recordings can be digitized and our directional microphone is good at picking out voices. Compared to typing on a keyboard, dictation is a much faster way to enter data and requires less steps to do so." Also, because it bypasses the eardrum, the bone conduction headset could be helpful to the elderly since people tend to become experience difficulty in hearing as they get older. So there are many hidden applications that could benefit Japanese society. Speaking about future goals, Mr. Nakao said, "Going forward, I'd like us to come out with devices that make life better for people."